Choosing an automated finishing system that best suits a facility’s specific painting needs can be challenging. However, IntelliFinishing has created a logic-based flowchart that uses easy-to-answer questions to help determine whether a simple monorail system, a power & free system (P&F), or a friction tube conveyor system (such as is offered by IntelliFinishing) aligns with an operation’s respective part types and paint processes. 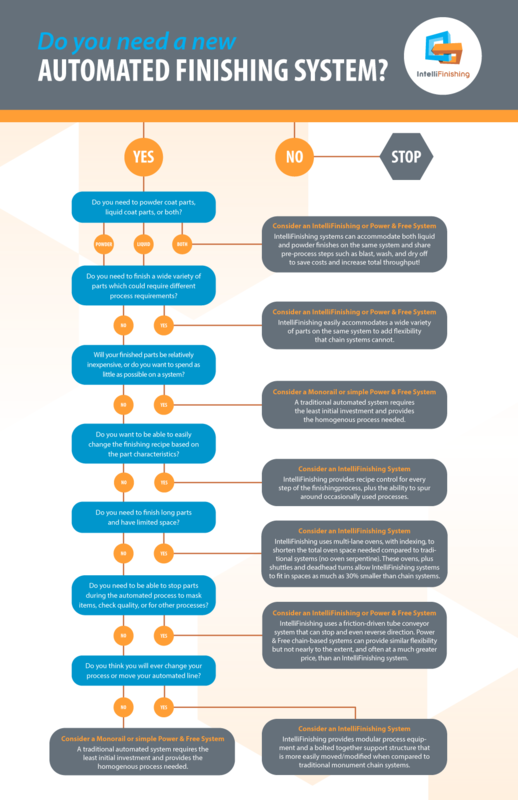 With simple questions such as “Do you need to powder-coat parts, liquid paint parts, or both?”, and “Will your finished parts be relatively inexpensive, or do you want to spend as little as possible on a system?”, stakeholders can use IntelliFinishing’s flowchart as a decision-making tool that rapidly assesses their actual requirements to ascertain which type of finishing system pairs to their business’ needs. In situations where total system cost is the most important consideration, a traditional system, like a monorail or simple power & free system, may be entirely adequate. This is especially true when processing similar parts that use the same exact finishing recipe. And while not exceptionally adaptable, chain-based systems have proven themselves to be extremely durable and reasonably reliable. A ballpark estimate of monorail uptime standards are about 80%. Costs for monorails range from a few hundred thousand for smaller systems to multi-millions for very large systems. Despite this, there is no question that a monorail system will typically be the least costly automated system available due to its sheer simplicity and availability. On the other hand, P&F and IntelliFinishing systems offer a much wider degree of system flexibility, but at increased costs. Much like monorails, P&F and IntelliFinishing systems include pre-finishing steps like blast, wash, dry-off, and masking, and post-finish steps like curing and cool down but both can increase the ability to process a wider variety of parts concurrently on the same system. P&F systems allow parts to drop off the chain to stop for processes or to move from one chain process to another through multiple chains and chain drives. IntelliFinishing systems also allow parts to stop as needed or to move on track spurs to and through optional processes. Either system can accommodate many recipe options including up to providing both powder and liquid finishes on the same system. However, an IntelliFinishing System provides many more movement options that chain systems can’t match such as the ability to speed up or slow down as well as the ability to move in reverse. For finishing processes that require a high degree of customization per part or the ability to adapt as process needs change, an IntelliFinishing provides a flexible and far from traditional solution. Using a friction-driven tube conveyor that can speed up, stop, and reverse direction eliminates the chain common on monorail and P&F systems. And no chain means that changes in one area—for example, in cure time, load time, or paint time—has little to no effect on any other processes occurring simultaneously! Plus, the dirt- and dust-collecting chains that require messy lubricants, drag heat from ovens throughout the facility, and are typically very noisy are eliminated. This translates into a higher quality finish with less rework; savings on oven heating costs; and a more comfortable work environment for operators. Depending on the complexity of the P&F system, they are often as or even more expensive than an IntelliFinishing system, but they are unable to provide near the extent of flexibility available with an IntelliFinishing system. IntelliFinishing’s use of shuttles, spurs, and deadhead turns allows for tighter use of floor space, especially for longer parts. Some clients report up to a 43% reduction in floorspace compared to same function P&F systems. Meanwhile, due to smart sensor technology, both the conveyor and most process equipment only run when the parts are present. This reduces electrical, heating, and water waste, saving costs while improving processing throughput. The modular design of an IntelliFinishing system also creates an easily expandable floor plan. Using modular process equipment bolted together in an easily modifiable support structure, IntelliFinishing systems offer superior functionality when compared to traditional welded-together chain systems. IntelliFinishing systems as well as changes to the system can typically be installed in a fraction of the time as alternative systems. Components and modules are typically constructed off-site and delivered ready to bolt together, reducing total onsite install time while allowing businesses to begin or change operations as quickly as possible with much less installation-related downtime. With an IntelliFinishing System, not only can manufacturers easily customize and control recipe configurations for each step of the finishing process, the system also automatically provides reporting and the ability to integrate with other database systems including most ERP systems. Recipe control, ERP integrations, and analytic data are typically not included or only rudimentarily available with most traditional chain-based systems. 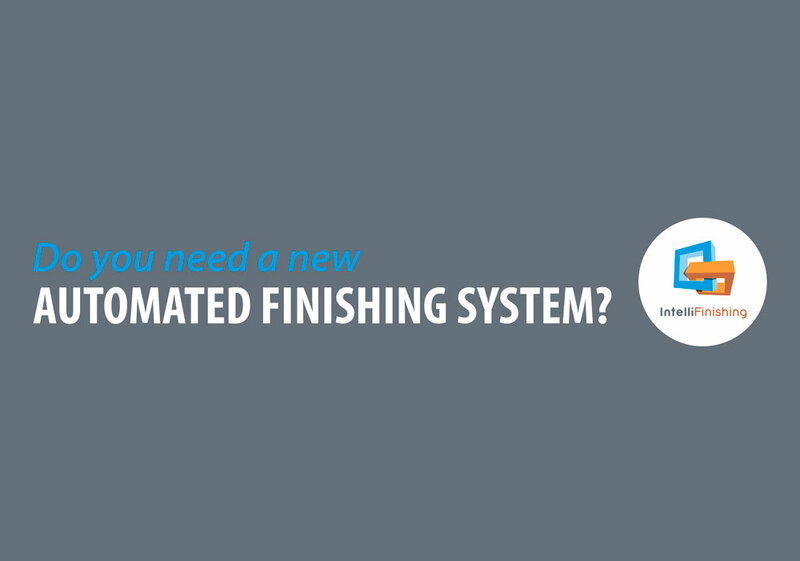 Facilities looking to add, upgrade, or replace their finishing system can use IntelliFinishing’s Automated Finishing System Infographic to determine whether an IntelliFinishing system or one of the chain-based systems best suits their finishing applications. For more information, click here to see videos of installed systems or here to see an overview video of the benefits of an IntelliFinishing System. To speak with a representative, call 785-309-0356 or simply fill out the Contact Us form on the IntelliFinishing website.